The boys are back in podcast town! 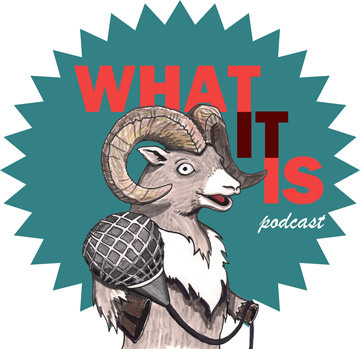 What It Is returns to the Edmonton Theatre scene in fine form with a top notch ep full of top notch guests. Join Taylor as he chats with The Citadel Theatre’s Daryl Cloran and artists Mieko Ouch & Kristi Hansen as they get the bullseye on The Silver Arrow: The Untold Story of Robin Hood. Plus, Taylor works out the rust (there’s a lot of it) in a round of The Good, The Bad, and The Ugly Advice. You’ll also hear from Netflix darling Chris W. Cook and get your Arts News fix from the one and only #theatremari. It’s been too long so get this ep in your ear holes! The theatre season is winding down and that means that festival season is winding up! We cover the International Documentary & New Media Festival North West Fest with Fawnda Mithrush who made some room in the fest for podcasters like us! Then, we get into personal stories with Trevor Schmidt, Matthew Lindholm and Amanda Neufeld while discussing NLT’s new production Bonnie & Clyde: The Two Person, Six Gun Musical. As always, we give you an update on other cool events to check out in Edmonton. It’s a timely ep and these events will soon be gone so get this ep in your ear holes! The crew is back for an all-new ep in an all-new year! Taylor chats with three guests in two different sessions. Get the deets on Star Killing Machine – a new production from Broken Toys and Peter Fechter: 59 Minutes from Cardiac Theatre. With Clinton Carew we discuss our what makes a musical and how the end is nigh for us all. Then, with Bradley Doré and Harley Morison hear their thoughts on why history has its place in contemporary theatre. Plus, Chris W. Cook lets us know about some of the arts happenings in the city with the Arts News. Artists of Edmonton do not slack off when it comes to January so get this ep in your ear holes and see some theatre! It’s a double shot of Edmonton Theatre in this new ep from the What It Is crew. We meet new-friends-of-the-show Murray Cullen & Theo Pitsiavas of Theatre Yes’ cross Canada experiment – Anxiety. Then, one of Edmonton Theatre’s most celebrated artists Darrin Hagen is joined by director David Cheoros to discuss their project Witch Hunt at The Strand premiering at Workshop West Playwrights Theatre. Of course, we’ve got the Arts News and all of the usual information about how you can find the show online… but you probably don’t need help with that so just get this ep in your ear holes! We assume things get humorous in this episode of What It Is as sketch comedy darlings – The Debutantes drop by to discuss their work and the awesome alt-comedy night Odd Wednesdays. We meet Liam, James and Carina from the 11 (or is it 12?) person sketch troupe and get the bottom of what the hell a debutante actually is. Plus, our old pal Dale Motherford drops by to let us know what he’s been up to and lays out some of his classic gotcha journalism with a round of The Question Attack. As always, we let people know what is going on in the city of Edmonton with a solid round of The Arts News with #theatremari. Kick back and toss this ep in your ear holes! It’s summer time and we take some of that summer time to dish on the busy Edmonton theatre scene. The action never stops in the city with plenty to check out including CHESS at Walterdale Playhouse and The Freewill Shakespeare Festival. You’d like to hear more about those projects? No problem! Meet Lauren & Kristen from CHESS and Cayley & Hunter (R & J) from Freewill Shakespeare. We talk community theatre, passionate artistic teams and mosquitos! Plus hear about even MORE art-happenings in the Arts News. Get this ep in your ear holes and #GoSeeAPlay and #ListenToThisPodcast! The guys from What It Is sit down with classical tenor Jacques Arsenault to learn more about the world of opera and how it relates to other forms of performance. Plus, you can get the details on Kill Your Television’s new show The Conversion playing at the ATB Arts Barns in Edmonton, AB. A little silly, a little serious but always, exactly, what it is. Get it in your ear holes for the best result.